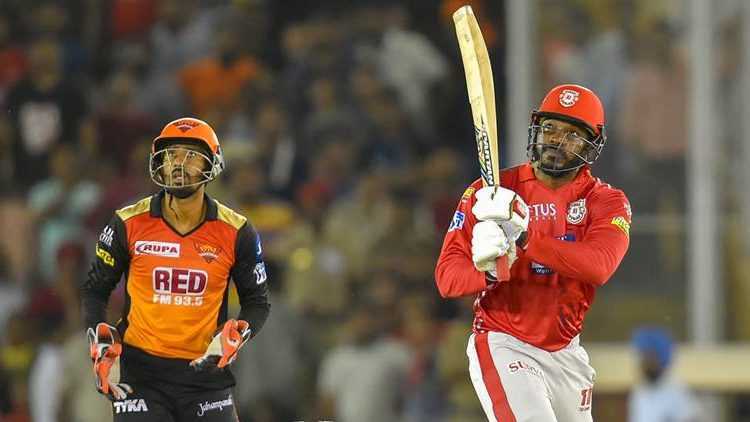 IPL 2019 Match 22- KXIP VS SRH will be the first after their last defeats in previous matches. SRH have edge on KXIP for the wins as per to the past head to head records. The IPL season 2019 will be hosting the 22nd match of the set with KXIP and SRH. With that, teams having the same points on the standings have crashed their defeats in last of their matches. Both the teams will be facing each other to get the wins and subtle position on the table. This match will be hosted by PCA IS Bindra Stadium Mohali at 8:00 PM (IST). Punjabis will be welcoming with the whole heart and will be waiting for another superb and thrilling match. Mohali: Kings XI Punjab batsman Chris Gayle plays a shot during IPL T20 cricket match against Sunrisers Hyderabad in Mohali on Thursday. The weather has not much effect on the pitch as no dew or rain is expected rather with a high degree temperature but with gradually lowering the temperature at the match. Pitch is much friendly to the team who wins the toss and will bowl first. Most of the squad will be remaining as same as the last matches of respective teams. As Chris Gayle was unable to perform in the last match he’ll be back in action for today’s match. SRH will be only concerning about the bowler’s fitness Kiwi spinner Kane Williamson as he’ll be not taking any risk for World Cup. Other than that all is fine on both teams. Sunrisers Hyderabad and Kings XI Punjab have set the stage and played against each other for 12 matches and with that on record 9 matches win by SRH and KXIP with 3 are recorded. This shows a little edge of SRH on KXIP. In the last matches of SRH and KXIP performance was a question on both teams. They lost their matches to MI and CSK respectively. This match will be against Hyderabad bowlers and Punjab’s Batsmen. Ravichandran Ashwin (C), Murugan Ashwin, Mohammed Shami, Andrew Tye, Lokesh Rahul (WK), Chris Gayle, Mayank Agarwal, Sarfaraz Khan, David Miller, Sam Curran and Mandeep Singh. David Warner, Jonny Bairstow (WK), Vijay Shankar, Manish Pandey, Abhishek Sharma, Yusuf Pathan, Mohammad Nabi, Rashid Khan, Bhuvneshwar Kumar (C), Sandeep Sharma, Siddarth Kaul.